The sun has a diameter of 860,000 miles – a giant nuclear furnace! 600 million tonnes of Hydrogen is converted to 596 million tonnes of Helium every second. The ‘missing’ 4 million tonnes is converted to energy. It is this energy that showers down upon our earth. Solar energy is equivalent to all the known resources on this planet, in one hour the earth receives more energy from the sun than we can consume in an entire year. It has been calculated that solar energy falling on an area 60 square miles is greater than the entire world’s energy demand. Here at energy BY DESIGN in Wimborne, Dorset we offer the latest innovations in solar thermal technology. As a result you get the most cost effective solutions for harvesting the suns energy. Our unbiased approach can design and install a system that is tailored to your specific needs. In addition to helping you to reduce your carbon footprint, also saving you money year on year. With unstable global energy prices coupled with the fact the UK has to import more and more fuel, installing solar panels currently represents real benefits to the home owner, increasing your properties value and reducing your energy bills. Solar heating achieves real energy savings year on year and is more affordable than you may think. 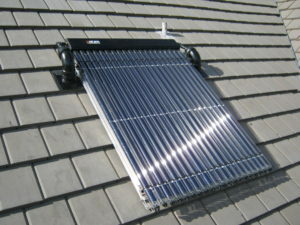 There are two types of solar panel, flat plate and evacuated tubes. Evacuated tubes provide more efficiency, generally giving you more output during the winter months when you need it the most. 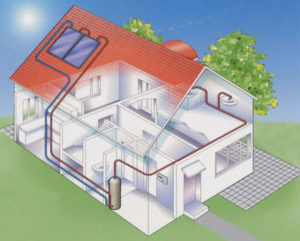 Solar thermal panels are designed to provide 50 – 70% of your homes annual hot water needs. Installing solar panels can potentially save you 400kg of carbon dioxide per year. Solar panels are ideally sited on a south facing roof. However east to west facing roofs are perfectly acceptable. The panels can be fixed vertically, horizontally or even mounted to an ‘A’ frame. ‘A’ frames can then be fixed to a flat roof or onto a suitable slab at ground level. Solar panel collectors absorb solar energy from the sun, not just direct sunlight, so they will even work when the weather is overcast! A liquid medium is heated and pumped round a closed system between the panel and the heat exchanging coil in a cylinder. Providing there is a greater temperature differential at the panel the pump will start. This is all done electronically via a solar controller. The cooled liquid then returns to the solar panel to restart the cycle. A boiler or other renewable energy system will then provide any back up as needed. To find out how solar panels can be linked into your home come and visit us at our energy BY DESIGN showroom in Wimborne, Dorset.